A lot of street driving novices might try to justify swerving like a maniac all over the road in some sort of effort to hit what they call a “racing line” with their car to be faster. They’re dumb, but the actual racing line is pivotal to get right, and there’s a lot of interesting factors that play into how a racing driver approaches a corner. This video from Chain Bear F1 provides a good explanation of what a racing line is, the mathematical racing line of a corner, and reasons for drivers to ignore the calculated racing line and do their own thing. The first factor the video covers is the size of the corner. A car will be able to drive through a wider, broader corner faster than it could approach a smaller, tighter corner. 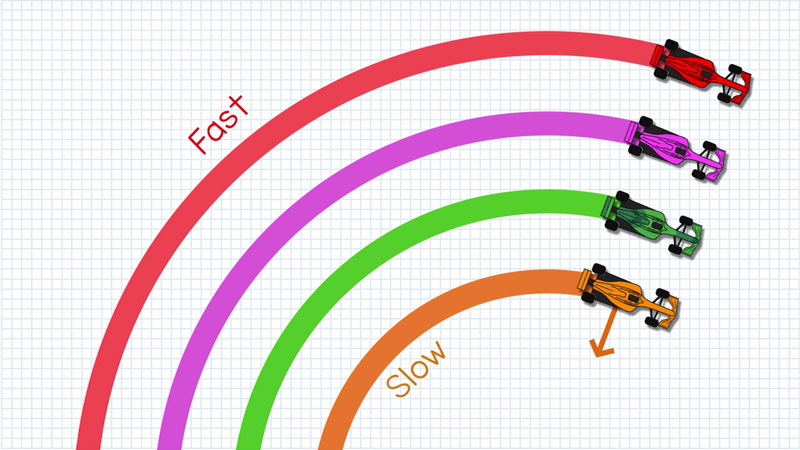 The faster a car is going, the more likely it is to have less traction and swing wider out in a turn. The fastest line through a simple 90-degree corner can easily be mathematically determined, but it’s not necessarily the best approach. It starts by touching the outside wall of the entry to the corner, hits the “true apex” or “geometric apex” of the inside of the corner, or the point of the bend in the road, and then swings out in an even curve to meet the outside wall of the exit of the corner. What’s left is a symmetric curved line to follow if you want to go as fast as possible through the corner. However, this may not be the best line to take for a racing driver on a course in the real world. How a driver actually approaches a turn depends more on what leads into and follows the corner than the actual corner itself. It’s more important to maximize speed around the circuit, which may not be the same thing as maximizing speed through just one corner. The video points out that the ideal racing line to set the car up for maximum speed in a straight following the corner is to brake later and take a sharper turn toward the apex. This method, which is often referred to as taking the “late apex,” sets the car up to accelerate into the straight much earlier than if the driver had followed the mathematically ideal line through the corner. A very late apex for a hairpin turn. The total amount of time for the car to get through the corner and the following straight with this approach will be faster overall than taking the fastest line through just the corner. It’s like visualizing the corner and the straight as one larger corner and recalculating the best line to follow. The late apex approach will be more effective the tighter and slower the corner is. The opposite approach would be called taking the “early apex.” If the corner of concern is followed by another corner, it’s better to maximize speed entering the turn and slowing the car down after the apex to set up for the next corner. If there’s a series of corners, it’s better to approach the situation as one large corner and keep focus on maximizing exit speed at the end of the series. The early apex approach keeps the car stable for the driver to navigate the corners, the last of which should be taken with a late apex line to set up for maximum acceleration out of the series. The video also covers what’s called the “karting line,” which is a wider line that isn’t as concerned with hitting the apex. It’s called the karting line because kart racing is less concerned with braking and acceleration, and more focused on maintaining momentum around the track. Racing cars also take the karting line in situations where the conditions are more unstable, like if the track is wet or if the car’s tires are heavily worn. Since there’s less grip and a lack of traction, taking a wider line approach is the fastest if you want to prevent spinning or crashing, because it maintains as much momentum as possible without relying so much on acceleration. A driver’s skill is in their ability to gauge and balance the needs of a corner with the overall strategy of the course. There are even more conditions and variables than covered here, and to win, drivers and teams have to develop a strategy that is effective on paper, as well as know how to adapt to the conditions in the heat of the moment. But maybe now you have a better idea of what a racing line is beyond just swinging wide on entry, curbing your wheels, and then going full gas on the way out.